In this episode, my guest is Carrie Dils of the Officehours.fm podcast, and a well known contributor to the WordPress community. We talk about moving your business away from trading time for money, gaining leverage and taking the knowledge you have and making products, courses and even a book from that. Listen to the podcast to find out more. In both Carrie’s podcast and tutorials, focusing on what her audience wants to hear or learn has been key to success. Be clear about what you want your audience to do and limit the choices so that it’s easy for them to make a decision and take action. I find it very important to free up “space” for creativity – content creation, writing, course creation. Sometimes that means getting away, on a long walk or a bike ride. To be more innovative and creative, it’s important to talk to people – find out what other people are doing and what they find interesting. As soon as I have an idea for an article, I’ll just create – give that a title and maybe an intro paragraph – I just blurt out whatever the main thought is and I’ll leave it in draft mode. Later, if I’m needing an idea for something to write, I’ll go back through my drafts and see what I feel inspired to actually flash out into a full post. Here are Carrie’s answers to the questions of our Innovation round. Watch the interview to get the full scoop. #1 thing to be more innovative – Step away from work to give yourself space to be creative. Best thing for new ideas – Conversations with other really smart people, e.g. like the WordCamp Hallway Tracks. Favourite tool for innovation – Follow the Pomodoro Technique, I use the Tomato Timer. Keep project / client on track – Good communication up front, set milestones and lead times. And nothing gets the client on track like sending an invoice! Differentiate – BE a PARTNER not a vendor. A partner wants the customer to succeed in their business. Carrie suggested I interview Diane Kinney, owner of The Versatility Group and co-author with Carrie of Real World Freelancing on a future InnovaBuzz podcast. So, Diane keep an eye on your inbox, for an invitation from me to the InnovaBuzz podcast, courtesy of Carrie Dils. Hi, I’m Jürgen Strauss from Innovabiz. Welcome to Episode No. 57 of the InnovaBuzz Podcast – designed to help smart businesses with an interest in innovation become even more innovative. We talked quite a lot in the interview about moving your business away from trading time for money, gaining leverage and taking the knowledge you have and making products, courses and even a book from that. It is another highly informative interview, so, without further ado, let’s fly into the Hive and get the Buzz from Carrie Dils. 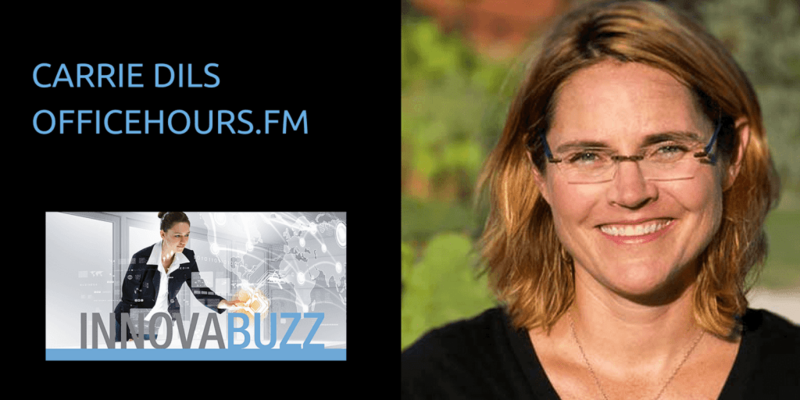 Hi I’m Jürgen Strauss from Innovabiz and I’m really honored to have with me today on this episode of the Innovabuzz podcast from Forth Worth,Texas, Carrie Dils. Carrie will be well known to everybody in the WordPress space. I certainly came across with you very early in my WordPress days. You’re a developer, consultant, prolific publisher and organizer of and a frequent speaker at many WordCamps and an author of WordPress courses on Lynda.com as well as host of Officehours.fm podcast. I believe soon to be published book author of Real World Freelancing, right? Which is due in early 2017. So Carrie welcome to the podcast. It’s a great privilege to have you here. Thanks Jürgen! It’s wonderful to be on. Kim Doyal suggested that we get you on the podcast so a big shout out to Kim, if you’re listening. Jürgen : Yeah we had a lot of fun on the podcast episode with Kim. Now, before we start talking about WordPress, podcasting, innovation, Real World Freelancing and so on, let’s find out a little bit more about you as a person. When you’re a kid, what did you want to be when you grew up? Actually I wanted to own a 50’s style diner restaurant.I don’t know why but it seemed appealing at the time. I’ve since had the opportunity to work in a food service and I have no desire to open a restaurant. Yeah that’s a lot of hard work, I would imagine. I had Michael Gerber on the podcast last week and once you get to the point of systemizing a whole lot like McDonald’s, which is the example he uses a lot, you might have come through the hardest part of it. [laugh] So what was your journey then to freelancing and working in the WordPress space? I’d sort of I guess came in the back door. It was not what I was educated for but something I’ve learned was how to do H.T.M.L. and so forth in college and when I graduated and was looking for work I came across some opportunities just for freelance graphic design and web development and I took it up. That was almost 18, 19 years ago. So, it stuck. I decided I like it. Okay, so you started building websites for other people in HTML and probably through Dreamweaver for some things. Okay. [laugh] Alright, when did you discover WordPress? Yeah it’s pretty good isn’t it? So only 5 years! Wow! So you’ve come a long way in those 5 years. Yeah. That’s right. So I probably discovered WordPress before you did but then when I saw some of your tutorials that you did in the early days, I thought, ‘Wow! This is really helpful!’ So I really appreciate that you’re doing that for the community and obviously, if you’ve wrapped that up in a big way on Lynda, a lot of the tutorials are around Genesis, right? The Genesis theme framework. How did you get into building tutorials? I’m looking forward to that freelancing book actually, but I’m interested in making that transition or maybe have made that transition from selling time for money into having tutorials and things online that are generating revenue from the one piece of work on an ongoing basis. Yeah, I think you hit the nail on the head and that is a desire to move away from trading time for dollars and so looking at my skill set and in figuring out what are some other income generators that I can add to the mix. As far as the tutorials came I originally started that out not not to make any money just sort of blogging as I was learning and I got a good response from the community on that, so I continued doing it. Then I kind of discovered through that I guess, I have somewhat of a knack for teaching it and explaining things and that sort of led into going more the formal course creation route. I guess a couple of years and it’s sort of the long game if you will. 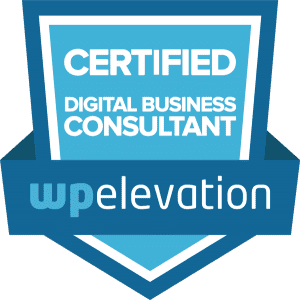 It’s not get rich overnight by any stretch but very slowly, it has enabled me to just back off on direct client services and focus more on creating course content. That’s right. So in terms of the training programs that you put together, do you have a plan for the themes that you put together? Oh is there a structure to it or do you focus on answering people’s questions? Ah, a little bit of both. So the courses I do through Lynda tend to be a combination of things that I’ve heard people asking about that they want to know how to do and that’s where some of those Genesis framework courses came out of and then some others are courses that maybe are older courses and in their library that need bringing up to date sops and things like css and frameworks and some of those courses that were wildly out of date. I’ve gotten to bring those up and update them so a little bit of both. okay, yeah. And do you have any plans to do your own online courses? No, It’s still I guess in the congealing phase in my brain right now but definitely something I want to do in 2017 is introduce some courses that are separate from Lynda, a little bit different type of content. I look forward to hearing more about that. And with your podcast, Officehours.fm, that’s been going for quite a while, hasn’t it? And I think it has over a hundred episodes. A hundred and twenty one as of today. Podcasting was…Maybe again this was kind of I entered through the back door. It started out, and the name is office hours and that generated from me wanting to virtually open up the doors of my office if you will and to give people an hour of my time or I would answer whatever questions they have and the thought process being that I would rather answer the same question and a lot of people hear the answer than just answer that question via email and only one person gets the benefit of the answer. Well, I think it was Brennan Dunn from “Double Your Freelancing” that originally I heard that from and that stuck with me. really did not want to ask me technical questions on the air. What they were more interested in is just questions about business and questions about what tools you use in your development and wanting to hear from guest and people I brought on the show so the show quickly changed to more of an interview format and that’s the same basic format I’ve kept for over a hundred episodes. That makes me tired to think about it and you’re already have fifty plus episodes in so you know how that goes. Yeah. So do just do interview formats? I listened to probably the last half a dozen of yours and not all interviews. Mhhhmnnnn (Affirming) Thanks for listening, first off. I’m just starting out in a season three which is a little bit of a format change. In the previous episodes in seasons, I’ve done a live show so people can submit questions via Twitter or Google Hangouts while the show is live and now I’ve moved it just to a prerecorded interview format so the shows are a little bit more structured and flow a little bit better than they did before or at least I hope they do. But yeah, I keep in that interview format. So you do answer questions as part of the podcast as a segment there? And you mentioned season, so you take a break in between seasons? with the benefit being that there’s an end in sight. There’s a light at the end of the tunnel, or a date that you’re shooting towards and once you reach that, you can take a break however long you want and then start up sort of the next season. And it also gives a nice kind of container to the show. If you want to do do something like change up the format or introduce some different styles but between season two and three I think I maybe had a five or six-week break. Okay, that’s interesting because we’ve kind of done interviews and then we’ve struggled to schedule things to keep going for the time so we had a break, an enforced break almost. But now I’m changing mine up a little bit to do solo episodes in between just to talk about particular themes so I’m planning out what sort of things to look at and we’ve got heaps of guests lined up at the moment so we’ll probably be booked for posting until well into January. It is and I enjoy doing it. It’s good fun. So but you’re right, there are times when you probably think about changing the theme up or modifying the format somewhat so that’s a good way to do it. So did you do anything specifically to grow and promote a podcast or did that just happen organically? on the show inviting them to share with their networks. Yeah, okay. And in terms of the themes and the guests, is there a theme for the season and a plan for the content in each podcast around that? So the theme for the season is more of the business aspect of WordPress. So while there are some conversations that are technical, it’s really more about how people who are either offering WordPress products or services are conducting their business, growing their business the things that they’re doing to be successful and the things that they found that worked very well in the hopes that a think a lot of the folks that tune into my show are freelancers or are aspiring to be self employed and so I’m hoping that that sort of the touching on the business aspect of WordPress can help them in their endeavors. what you describe there, the coaching or our the ideas around have people run the business in various areas and that’s always a challenge for freelancers particularly when they first start out. Carrie:And like you said I get to sit down and basically have a little mini mastermind session with some really smart people. Yeah that’s cool, isn’t it? So I’m interested, because we talked earlier about trading time for money and I know you’ve got a theme that you’ve developed that you put out there for sale, essentially productizing one of the services and the book to come next year, so is that a strategy now that you’re looking at developing products that have a life beyond the time you’ve invested in them? Absolutely. And again it’s sort of all a long term strategy but I’ve done the theme and really I’m still kind of pondering whether or not that’s an avenue I want to continue to put products in that theme space just because there has already so much in the market. But definitely on the course and content creation side, I’d love to be able to put more of that out in into the market and maybe find some more creative ways to monetize the content that I already have out there. I’ve managed to over every years build a strong following but I’ve never really monetized that following. That sounds kind of evil. I want to you know reach into their wallets which is this is not the case but I think I’m just sort of at a crossroads where I have already laid the foundation of building trust with an audience and a consistency in content and this next year will be about figuring out some smart ways to earn a living from it. Yeah. Well I think you touched on a number of interesting points there because you’ve clearly built a whole lot of knowledge around the services business that you have, developing websites with people and then sharing that knowledge essentially at no cost through various avenues, and in some point your drive your motivation, your energy or the time you have also to continue sharing like that has to step aside for paying the bills, right? You’re gonna pay the bills so you take a break from that and go back to things that earn money. And also the other side of that is I think that people consume a lot of this stuff but they don’t necessarily take action. They will be motivated to take action on it and get more value from it they actually paid for it. In some ways you’re doing people a service by charging it. Aha, you know what that’s a really interesting point. I never considered it that way. Maybe it’s like,I don’t know, going to the gym. You’re more likely to go if you’re paying for a membership or what not. Yeah. So there’s a lot there. You’ve been very prolific as I said at the beginning. And I was interested in the talk you gave at, I think it was at WordCamp Houston recently and I had a quick look through the slides and I think the theme was about choice. I just saw the slides but I saw one and I thought it is really good.You said something like every time you give a user an option, asking them to make a decision and you’re actually making them frustrated because if they don’t understand what their choices are the decision is actually too difficult for them. I thought that was really neat and I think there’s a bit of a philosophy behind that which you could come back to in some of your training because you’ve got so much material out there and people sort of look at various things and say, ‘Which one do I do? What structure do I follow?’ So maybe it’s about leading them through from a start point to a big win, something like that. Yeah, Well, you just managed to sum up the talk in thirty seconds very, very nicely and I think you’re right. I just recently went through a site redesign and part of what I was hoping to accomplish with that was to better funnel people to the content that they wanted because in the previous iteration of my site, it’s like you said you can just get lost in there and there’s no clearly defined learning path. So I’m trying. It’ll be an ongoing experiment but you’re absolutely right. There’s a psychology behind it that, the fewer the choices are actually, the easier it is to make a decision. It’s easier to choose between A and B than for choosing A.B.C.D.E.F.G, etc. Yeah that’s right. And it’s probably less regret at the end so it’s a bit of a case of Henry Ford’s philosophy of you can have any color as long as it’s black. [laugh] All right so what are the biggest challenges that you face in your business right now and how are you tackling those? So what do you do to switch off and free your mind like you’ve described? I love getting out and just taking long walks or maybe go for a bike ride. Those sorts of things or basically where you could just let your mind wander or be mindless and just enjoy the great outdoors. I find it very refreshing. Yeah, it’s great! I’m a keen bike rider too and that’s the time particularly if I’m on my own on the bike, that’s the time when often I start to see different ways of doing something and things will just come to me. You stop trying to think about something and then you find solutions. Or a lightbulb moment. Yeah, that’s right. And I think, as you say, sort of just being go go go, pressure or whatever it is and your mind’s focused on something else. So what are some of the most innovative things that you do in your business? Oh I don’t know if I’m innovative or not. [laugh] I think this may sound kind of weird but talking to a lot of people and keeping an ear to the ground about what other people are doing and other people are finding interesting. I get so stuck in my own you know routines and ways of doing things that hearing how other people operate and hearing what other people are interested in helps me think more creatively about my own business. I don’t know if that falls under the innovation category or not officially. Yeah. I mean my definition of innovation is essentially an improvement that adds value. And it doesn’t have to be a transformation. It can be incremental. So I think that falls under the innovation mindset. I had a lovely discussion with Michael Gerber last week and he pretty well nailed down the difference between innovation and creativity on that podcast which was quite enlightening actually. I never heard somebody express it that way but he basically said innovation is continuous improvement and creativity is actually taking something beyond where it is today and it’s actually going totally into the unknown because it’s building something that you may not even know what it looks like, you may not know what the end result is and when you get there, you might not even know that you’ve got it, but it’s developing something completely new. So he kind of separated innovation and creativity which I found fascinating. Yeah I hadn’t thought about it in those terms either. I’m a big fan of Michael Gerber. I have to go back and catch that episode. Alright, If you had a magic wand and could fix one thing in your business, what would that thing be? But seriously I would love for those kind of uninterrupted blocks of time to coincide with creativity for writing more. It seems that, that’s a lot of other things you can shove into a thirty minute time slot or little tasks here and there but a single blog post can take up to six or eight hours. I am a very slow writer. I would wave my magic wand over my schedule to to give me a uninterrupted time blocks with creativity. Hmnnnn.. It’s interesting. So did you kind of write a bunch of blog posts at once or do you think of one topic and you work on that one till it’s done? So as soon as I have an idea for one I’ll go and just create. I’ll give that a title and maybe an intro paragraph- I just kind of blurt out whatever the main thought is and I’ll leave it in draft mode. And then at other times, if I’m needing an idea for something to write, I’ll go back through and look at my drafts and see what I feel inspired to actually flash out into a post. But generally speaking, it starts with an idea and then I’ll do the full post versus balancing around to different ones. Hmnnnnn.. I was chatting to Kim when we were doing her podcast interview and she’s doing this daily e-mail thing now where she writes an email every day, basically what her thoughts are right now, what she’s working on, what her challenges are, so it is very transparent in everything and the philosophy behind that of course is the more you practice writing the better you get at it. It’s like everything. All right, so tell us a little bit about the book that’s coming out next year, Real World Freelancing? Yeah. So the book is basically If I could have told my freshly-graduated-from-college-self what to do and what not to do to be successful in freelancing, in tech freelancing specifically, it would be this book. So that’s sort of the vision for it and my co-author Dianne Kenney who’s working on it with me and she has extensive experience in the freelance world and she’s done a lot more agency type work versus me. I have done a lot more solo work, so together we kind of bring hopefully with a well rounded look at freelancing and not specifically to WordPress. I think the book can be for anyone who is self employed so everything just practical stuff like setting up a legal structure for your business, how to create a budget and don’t forget to set aside money for taxes etc., etc. And things like pricing, handling clients and some of the soft skills that are required to really help you succeed in business. So that’s in a nutshell what the book is. And again I’m just hoping that maybe if if somebody comes along that was in my shoes, previously in my older shoes. That sounds weird. [laugh] But that this book will be able to help them and I know a lot of us or at least myself I have to always learn lessons the hard way even when I have help but hoping that maybe we can save people a hard lesson or two. Yeah that’s a great mission and I think you said that this book is the book we wish we had when we started. So it’s pretty clear what the target audience there is and I hope that those considering starting out afresh or even those that are looking to improve their business might take a look at that, and we’ll post a link to that in the show notes. Alright. This has been great Carrie. I think we must move on to the Buzz which is our innovation round and it’s designed to help our audience who are primarily innovators and leaders in their field to get some tips from your experience and hopefully help them do something awesome as a result. So I’ve got five questions and hopefully we’ll get some really insightful answers. So first one. What’s the number one thing anyone needs to do to be more innovative? Oh man! I’m going to go with a kind of what I said earlier which is that step away. Step away from your work and give yourself a little mental space. Jurgen: Yup that’s great. I love that. What’s the best thing you’ve done to develop new ideas and new products? It’s funny how those things evolve. All right. What’s your favorite system or tool for improving productivity and allowing you be more innovative? I really like Pomodoro Technique and there’s a website called Tomato Timer. But the basic premise is that you work for 20 minutes kind of heads down, no distraction and then take a 5 minute break. Rinse and repeat. So say you’re opening your inbox and you’re saying, ‘Alright. I’m going to be in my inbox for 20 minutes. If it doesn’t get done in 20 minutes, then you know it’s done. And I found that when you counted box or time like that and put a hard end on it. It’s it makes it really hard to launder because you’re focused on getting it done in that little segment of times. I found that really helpful. That’s great advice. Carrie, how do you actually discipline yourself as part of that? My challenge is I get to the twenty minute mark and, ‘Ah, I’ll just finish this one,’ so do an extra little bit and then before I know it, an hour and a half is gone and I haven’t moved on. Yeah I actually use a Google timer. I don’t know if you know Google timer. If you just type into a browser a twenty minute timer, it’ll start the Google twenty minute timer and it actually beaps after 20 minutes until you go in and stop it. So it interrupts you. I mean I’ve done the same thing as well but I think realizing in the long run it’s counterproductive to do that too many times in a row. Yeah okay. So get a bit of discipline as well! So the Pomodoro Technique, we’ll have a link to that in the shownotes because I think that is a really good technique. I enjoy doing that. I think it does make it a lot more productive. What’s the best way to keep a project or client on track? Oooohhhh, good communication up front about what their milestones are for any given project so that they get lead time, they know what’s coming up and I’ve also found that nothing motivates a client quite like sending them an invoice. By the time they pay you, they want certain milestones or deliverables met. So that’s a good way to keep them on track. Hmnn, great advice.Yeah, alright. What’s the number one thing anyone can do to differentiate themselves? This seems a recurring conversation with people lately about the difference between being a vendor, a vendor that your customers use to either build a website or do the SEO or whatever. A vendor versus a partner. A vendor is a cost. It’s an expense. Whereas a partner is someone who really comes alongside a customer and wants the customer to succeed, so vested in the success of the people they work with and I think that when you’re working in a space like WordPress where it’s really just become kind of a commodity and you can find people who can build websites for $10 dollars. What makes me think that I can charge a hundred times that or thousand times that and I really think it’s that piece of being able to partner, come alongside your client and help them reach their success versus just taking whatever it is they tell you to do and going and doing it. That’s a great advice. I love that because I certainly value the people that help my business in terms of being that partner and are vested in my success as well and a lot of times it works both ways rather than have somebody, ‘Okay, here’s your website. Good luck with that.’ It’s actually working with them to make sure it is successful in the long run and it’s part of the business success. All right so we talked a little bit about your future. What what are some of the other things you’ve got on the longer term horizon? I hate to sound like a broken record but 2017 really is going to be about stepping away probably making an almost complete step away from direct client services to focus my energies on coaching and creating training materials for either either tech or freelance-based materials. Since you mentioned cycling earlier in a common interest there, I’ll tell you that in April, either late March or early April, I’m hoping to do my first duathlon. Is that cycling and running? Cycling and running. So run and cycle and then run again. Yeah. It’s great. So you need to train for that. That’s a pretty tough combination not quite as bad as the triathlon but certainly tougher than just going for a little ride. Yeah. I’ll dip my toes but into duathlon, who knows, maybe eventually a triathlon. We’ll see. Yeah. Well, best wishes for that and for the training there. Where do you see the WordPress and the industry headed? But I think we’ll continue to see WordPress mature. I mean it’s already matured greatly in the past five years both of the software platform but also the business ecosystem around it. So I’d like to see, I don’t know if this sounds kind of bad or not, but basically get rid of the middle class when it comes to web services. So you’ve got people that are serving at the lower end of the market and people that are serving the higher end of the market. And maybe I stated it wrong. I guess there’s always going to be someone in the middle of the market too but I guess a greater differentiation between the person who will build a website for $10 dollars and the agency that will truly partner with your business. And I think a large part of that, other than of course, is the service provider being able to differentiate ourselves but a lot of that too is I think market education and how people perceive WordPress in the value of what it can do in their business. I don’t know if any of that made sense but it was somewhere in my crystal ball. It’s fascinating that WordPress is – I think it’s about 22% or 23% of websites on the Internet now are WordPress. If I remember the number right, I haven’t checked for a while so it might be higher than that. I think we’re up to 26% now. More websites have problems and the ones that are around more, you can then bend that statistics in anyway you like. I mean looking back when I first discovered WordPress, it was pretty much a blogging platform and I decided, ‘Hey you can actually hack this a little bit with some plugins and with some customization to turn it into a C.M.S.’ which I did and that was where I started off and then all of a sudden I think it was version 2.4 or 2.5, all of a sudden I realized I could ditch a lot of my customizations because now they’ve actually turned WordPress Core into a proper C.M.S. And that was a big transformation and I just wondered whether there’s another big transformation like that somewhere down the line, whether it’s sort of mobile app focus or what, I don’t know. Yeah, it’ll be interesting to see if WordPress continues as one kind of giant platform or if it gets sort of forked off to be more specialized by industry or requirement. So maybe a leaner core and then more modular based on what you’re doing with WordPress. Yeah. So what’s the number one piece of advice you’d give to any business owner in this space who wants to be a leader in innovation? Talking is okay too but there’s a lot of people who all they’d ever do is talk. I think the the people who are findings success are the ones that you know they’ve got their heads down and they’re doing the work. Yeah, that’s great advice and you’re certainly one of the doers because all the content and things that you’ve produced and shared as well as the work you’ve done to actually build that experience and learn those things. So thanks Carrie.This has been really great. Where can people reach out and say thank you? Thank you first of all for having me on. It was a pleasure to chat with you. I’m on Twitter at-cdils. And that’s probably where I hang out the most. I’m also on Facebook as Carrie Dils. And of course my website, carriedils.com. Drop me a line any of those places. We will have links to those in the show notes as well. Who would you like me to interview on a future podcast and why? Well. I knew you’re going to ask me this question Jürgen so my answer may sound a little bit biased but I would love for you to interview, Diane Kinney, my colleague who’s working with me on the book. She’s got just years of really interesting experience especially in that client management and project management arena and I think she would have a lot of value to share with your audience. Excellent! Thank you. So Diane we’re coming to get you, courtesy of Carrie Dils. Thanks Carrie thanks for sharing your time and your insights with us so generously today on the Innovabuzz podcast. I’ve really enjoyed this and as I said earlier, they seem to be a master class for me and hopefully they turn out to be the same for my audience as well. So I wish you all the best for the future of your business for the book launch, The Real World Freelancing and also for the officehours.fm podcast and all the other initiatives that you’ve got underway and also for the cycling duathlon. So let’s keep in touch. Yeah! I appreciate it so much and I look forward to chat more in the future. I hope you enjoyed meeting Carrie as much as I enjoyed this interview and of course, also learnt things by listening! All the show notes for this episode will be at innovabiz.com.au/carriedils, that is C-A-R-R-I-E-D-I-L-S, all lowercase, all one word, innovabiz.com.au/carriedils, for all of the links and everything we spoke about in this episode. I’m really grateful that you’ve listened to this point and I trust that you get great value from these episodes. Pop over to iTunes or Stitcher or Pocket Casts and subscribe so you’ll never miss a future episode. While you’re there, leave us a review, because reviews help us get found and also tell us what we can improve and what you’d like us to cover, or questions you want answered on future InnovaBuzz podcasts.